“I have aphasia” cards are designed to help individuals with aphasia to communicate with people they are meeting for the first time. The cards fit easily into a purse or wallet and are printed on both sides on flexible plastic to make them as waterproof as possible. Cards are available to purchase in bulk for hospitals, rehabilitation units, speech pathologists, other health professionals and organisations. 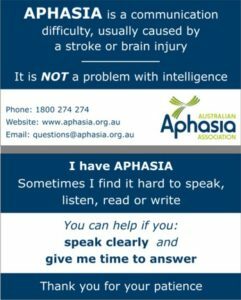 You can purchase the “I have aphasia” cards in a pack of 50 or a pack of 100 from our online shop.